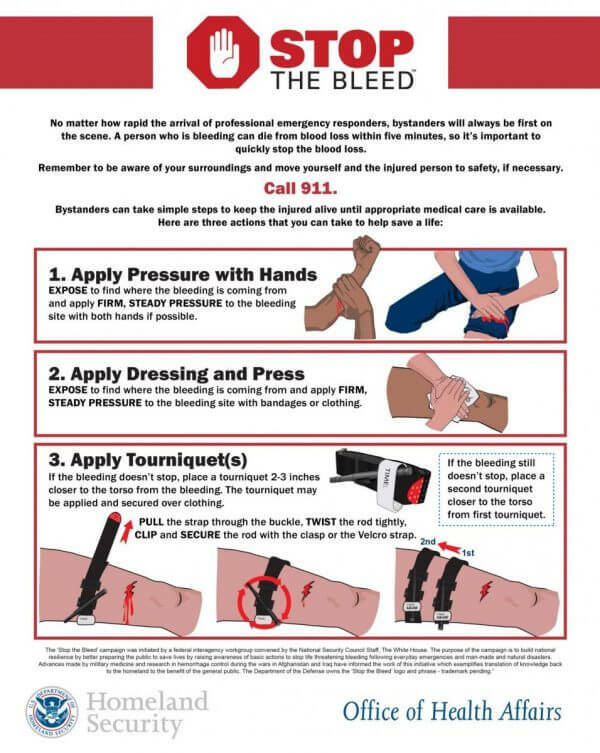 How to Stop Bleeding - "Put Your Hands on the Red"
Learning how to stop bleeding is one of those things that can overwhelm people. There are all kinds of acronyms and other memory joggers out there that try to help you remember what you’re supposed to do. I have a hard time remembering things like that under normal conditions, let alone a high-stress situation! In this article, I’m going to talk about how to control bleeding and why it is the first thing you should do when treating trauma. I’m also going to explain why you do the things that you do. If you know why you do something, then you don’t have to memorize a checklist or an acronym that you will most likely forget in the heat of the moment. A long time ago I was told something by a Special Forces medic that has stuck with me to this day, “Put your hands on the red.” This simple phrase has gone through my head every time I’ve had to work on someone bleeding uncontrollably (mostly blast-related traumatic amputations). It’s simple, easy to remember and easy to implement. It also does something else…it gets you doing something. Just starting to act can often get you past that initial shock and get you into the fight. This article is mainly focused on stopping bleeding from severe wounds. If you are dealing with a smaller, manageable wound, the application of direct pressure is the best option. Apply a bandage to the area, put pressure on the wound with your hand or use a pressure dressing (like an Israeli bandage) and elevate the wound above the heart if possible. This reduces the blood flow to the area and assists in stopping the bleeding. If the bleeding does not stop, then you will need to apply a tourniquet or a hemostatic impregnated dressing (discussed below). For amputations, try to apply the tourniquet lower than the next joint up the appendage. For example, if someone has suffered an amputation mid-forearm, you would place the tourniquet below the elbow. This increases the likelihood that the elbow, and the stump below it, can be saved making the fitting of a prosthetic much easier. Do not sacrifice the efficient placement of the tourniquet! 2 hours is the generally accepted length of time that a tourniquet can be in place. Post-tourniquet syndrome is sometimes found in patients who have a tourniquet on for periods longer than 2 hours. This syndrome is marked by the loss of feeling in the limb. Patients normally regain full feeling in their limbs in 1-6 weeks. The picture to the right shows the location of pressure points that are useful when stopping bleeding. The two most common pressure points used are over the brachial artery (high in the armpit) and femoral artery (high in the groin). To assist in stopping the bleeding from a wound, put pressure on the brachial artery for an arm wound and the femoral artery for a leg wound. If you are working with a partner, have one person place pressure on the pressure point while the other treats the wound. If you are by yourself, you can use your knee to put pressure on the femoral artery so you will be able to use both hands while treating the wound. A good way to put pressure on the brachial artery is to place something into the armpit area, then use your leg to push the patient’s arm toward their body, putting pressure on the artery. You can even do this to yourself if needed. Place a balled up towel or t-shirt in your armpit and place your body weight onto that arm. With some amputations, it is hard to tell if you’ve stopped the bleeding. This is especially true if you’re on a surface that is quickly absorbing the blood. Before you move to another patient, be very sure that the blood flow has stopped. I carry these three items: Adventure Medical Trauma Pak, Ever Ready Battle Dressing (AKA Israeli bandage), and Combat Application Tourniquet. For around $60 you can stop almost any type of bleeding. Together they make a kit that can fit in a large pocket or slide in a pack or purse. This isn’t the end all, be all of trauma kits but it is very robust for the size and cost. These are the same items we recommend that you include on your bug out bag list. As always, please contact your local Red Cross for proper first-hand training. This article is as complete and current as we can make it, but it is not a substitute for first-hand training. Please like, share and pin this article if you found it worthwhile! Stop by our other first aid articles for more info everyone should know! Did this article help you better understand how to stop bleeding? Please let us know below! Before you go, head over to our other first aid and medical articles.